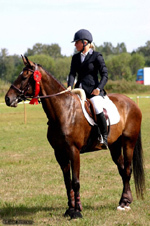 Since 2008 Saksa Riding School has three stars (***) which is the highest rank. 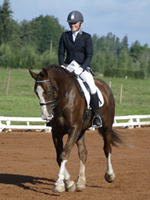 We have offered gorse-back riding service since 1992. At the beginning there were only few horses. Up to this day, it has changed a lot. Currently we have about 50 horses and about 15 of them are actively participating in riding school lessons. The lessons are held in sandy riding place (45x65m). It is possible to ride on cross-country ground where usually the jumping trainings are held and after training the horses are taken to walk and relax. In summer we use it also as a paddock. In bad weather conditions the trainings are held in manege (20x15m), which was built in 1994. The manege is covered with sand and has a heatable room for spectators. Many events are held there. In 2003 we built a warm-up manege (20x15m).